If you work in brand consultancy or a brand strategy department right now, you might be a bit worried about your future. There are a lot of marketers on both client and agency side talking about the death of branding, marketing and strategy. Kevin Roberts from Saatchi’s has been particularly vocal with his talk at the Institute of Directors annual convention in the UK. There have been other keynote speeches at Cannes and Spikes in 2012 that promoted the ‘don’t think, just do it’ approach. The trouble is, this ‘put it out and see if it works’ approach is not far removed from the myopic thinking of ‘build it and they will come’ which led to the vast microsite graveyard. Do branding and strategy people need to start polishing their CVs? Well if you’re still hiding behind brand architectures created in workshop vacuums without real people and still believing there’s a single brand essence, promise and big idea that should flow through everything then maybe it’s time to start crawling for recommendations on LinkedIn. We still need good brand strategy and big thinking. We just need to change the rules, and that does mean less talk, more listening and more action and more re-action. We need to change the rules by which brands are imagined and behave. The most loved and effective brands are an intrinsic part of culture – stimulating interest, involvement and advocacy without constant media support. They are authentically valuable experiences that people participate in, not just a string of marketed products and services that they consume in a passive way. The successful brands of today and tomorrow are Participation Brands. These brands put participation at the heart of the brand experience – not as an add-on. They create a gravitational pull enabling them to outsell without having to necessarily outspend their competition. Being a participation brand means you still have to have a strategic purpose – it’s not a free for all of random initiatives. However, this purpose is not something that sits on a PowerPoint slide. It’s a dynamic, evolving and collaborative system embedded into the operational DNA of the organization. It’s an approach that’s designed to involve customers, stakeholders, fans and beyond through immersive and interactive initiatives that allow people to join in, connect, converse and co-create. Essentially, a brand is only as good as the sum of their audience’s positive interactions, so value comes from creating an ecology of interconnected experiences that drive advocacy. But this ecology is designed from a strategic intent that allow the brand to be a part of the fabric of an ever-evolving culture of passions, relationships and conversations, not a fixed entity demanding a pre-determined consumer response. A word of caution though. Participation branding isn’t just doing ‘more digital and social’. Genuine participation brands think content, context, experience and conversations. This means planning for all interactions and possible participation moments. Of course technology leaps through multiple screens and surfaces brings multiple opportunities for participation. We should also develop initiatives for human interactions at events and experiences, call centres or in retail environments. Technology is an enabler that allows for greater participation in all of these interactions that the brand can have with people and create a cohesive ecology. Participation branding doesn’t mean trying to get everyone to get deeply involved at all times. That’s unrealistic. But people have different motivations that can lead to different tactics. Being useful, driving belonging, enhancing one’s status, rewarding and recognizing my contribution – these are all different motivations for participation and sharing of ideas. 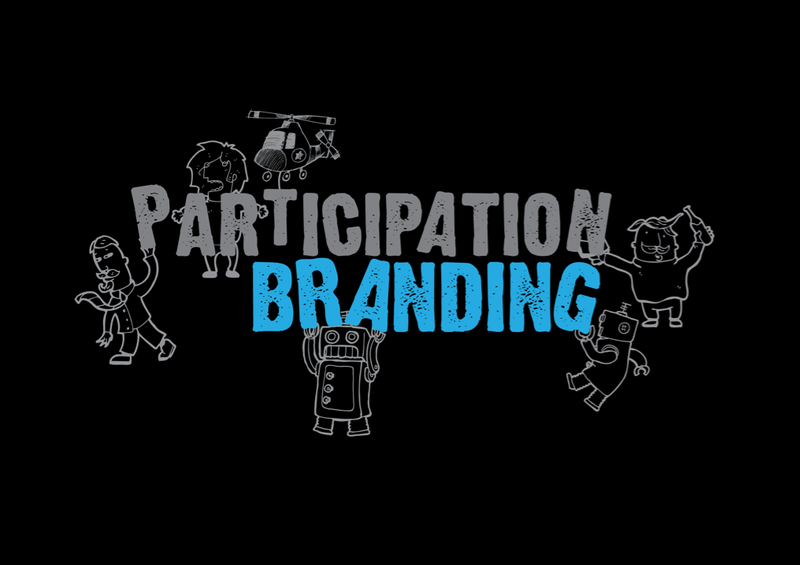 So how do you create a participation brand? Where do you start? We all know the famous 4P’s of marketing, well, we think there are now 5 principles governing successful participation brands, they just happen to start with ‘P’ as well! Purpose & Passion. Believing in something and being willing to make it happen as the way to drive profit and perception. It’s essential to align with people’s passion points. Being interesting in what people are interested in and making sure your brand has a meaningful role. Prototype. Trialing new business models, new initiatives, and not being afraid to bring people into those prototypes and learning on the fly. This means living at the speed of culture, not the speed of research. Being in a constant state of beta mode. Play. People change their behaviours when they actively get involved and do something. The principles of play and gaming allow people to see goals and get rewarded. Marketers need to stop thinking about their brands as static systems, but rather ask themselves ‘What game are we asking people to play with us’ ? Participation brands let each and every person leave a bit of their DNA on an idea. They leave space for a person to ‘mark’ the experience as their own so they can pass it on as their branded involvement, not the company’s. Presence & Propagation. We can’t just be engaging people when it’s convenient for us. We need 365 days of presence not 360 degree bursts of activity. In this digital age people actively filter to find what interests them. So we need appropriate propagation of our initiatives – through advocates, adorers and ambassadors, but also realizing that there is still a necessary role for paid media too. However, media should be targeted, relevant and encourage participation. Pivot. (With thanks to the Lean Start Up). Great participation brands know that to stay relevant they need to constantly PIVOT and react to what’s happening in culture. Planning for content you don’t create and setting up structures to be able to evolve and adapt your product and campaign ideas depending on how your community interact with them. Participation brands are not afraid to move on. Some things run out of steam. Don’t flog an idea beyond its shelf life. But equally, remember that marketers and agencies get bored a long time before ‘real people’ do. You need good reporting, KPIs, benchmarks, measurement and evaluation. So who’s doing it well? Of course the titans and icons of Nike, Apple, Google and Red Bull all have participation baked in: Nike’s Fuelband, every Apple product, Chrome’s initiatives with Jay Zee or with Lego and Red Bull with their music and action sport initiatives. But what about in APAC and in Australia in particular? The work we’re doing with Johnnie Walker’s sponsorship of the Vodafone McLaren Mercedes F1TM team – the ‘Step Inside’ platform is an example of creating content, experiences and conversation around different contextual environments with different levels of participation. Branded content videos offer people a low-effort way of seeing what’s happening inside the circuit with Lewis and Jenson. This is linked to promotions in duty free, bars, clubs and grocery outlets. Branded events activated through social media allow a deeper level of participation and the opportunities to get really close to the glamour and the action of F1TM with face-to-face conversations with the drivers or the opportunity to drive an F1TM car. 2012’s most successful campaigns like ‘Share a Coke’, ‘The Perfect Lager Project’ for Arvo beer, ‘BYO Cup Day’ for 7 Eleven and ‘Mobile’ Medic’ for the Australian Defence Force – all had participation baked into the DNA of the idea. All with amazing results. So, no we don’t think we’re living through the death of marketing, but rather 2013, will be an amazingly exciting time for brands. But brand consultants, strategists and planners need to throw away their wheels, onions and pyramids. It’s time for us to leave our ivory towers and get involved with the real world. It’s time for strategy to participate. Nothing amazingly new here, but it’s still cool to watch. Adidas putting together a 3D projection spectacular in France. Quite a cool initiative from Lynx in the UK. To promote Lynx Excite antiperspirant they’ve come up with an ‘Angels’ theme and brought it to life via an Augmented reality stunt at Victoria station. People were asked to ‘Look up’ (at the digital billboard) whereby they interacted with an AR ‘Angel’ via an interactive billboard. Very cool use of AR to generate a great simple experience worth talking about. All the tennis Grand Slams have kids corners, areas where kids can go and hangout while their parents are watching the long matches. At the Australian Open this year, Nintendo had a cool Wii tent. I’ve just gotten back from Roland Garros in Paris and the standout at ‘Espace Animation’ (kids zone) was Adidas. To promote their lightweight ‘speedy’ Adidas Barricade tennis shoes (used by world #4 Novak Djokovic) they created a running event where kids were timed running in a zig zag format. Kids got to run using the Adidas Barricade shoes (see blue shoes kids are wearing) and they were timed. Was a cool little bit of experiential marketing and kids were loving it. Funnily enough, BNP Paribas created a ‘sprinters’ running race across the way but it had hardly any kids taking part, unsurprisingly. Overall a nice piece of experiential for kids, not brilliant, but certainly engaging and a bit of good old fashion fun not relying on gadgetry.